Let us pray, dearly beloved, to God the Father almighty, that he may cleanse the world of all errors, banish disease, drive out hunger, unlock prisons, loosen fetters, granting to travelers safety, to pilgrims return, health to the sick, and salvation to the dying. Almighty ever-living God, comfort of mourners, strength of all who toil, may the prayers of those who cry out in any tribulation come before you, that all may rejoice, because in their hour of need your mercy was at hand. Through Christ our Lord. 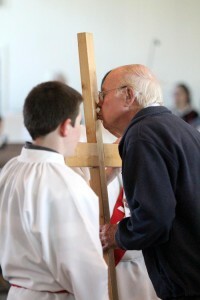 The Way of the Cross, a station-by-station meditation by CatholicPhilly.com columnist Michelle Francl Donnay, includes artwork from Stations in churches in the Philadelphia Archdiocese. Stations of the Cross: A meditation in glass, incorporates stained glass images of the Stations from St. Anne Church in Philadelphia.